As I mentioned a couple of weeks ago, in addition to my usual busy summer working on the NHL Official Guide & Record Book (more on that next week), I’ve been working on a lot of books of my own recently. The biggest one in terms of size, time, and – hopefully! – impact is my new book for Dundurn, The Toronto Maple Leafs: The Complete Oral History. The original cover was somewhat similar, but had just a generic image of a hockey stick and puck. I never loved it, but it was certainly hard to think about which one player should be on the cover. A picture of Maple Leaf Gardens struck me as a possibility, but that’s hardly the most dynamic image. This redesign happened without any input from me, but I’m very pleased with it. It’s hard not to like a smiling Bill Barilko! It was 66 years ago this week, on Friday, August 24, 1951, that Bill Barilko and Dr. Henry Hudson took off on their ill-fated fishing trip. Two days later, on Sunday, August 26, they crashed while returning to their hometown of Timmins, Ontario. A few months earlier, Barilko had scored the Stanley Cup-winning goal against the Montreal Canadiens in overtime. The Leafs would not win the Stanley Cup again until 1962. A few weeks after that, the wreckage of Barilko’s long-lost plane was finally found. If it wasn’t a true story, it would have been too unbelievable for someone to make up. Bill Barilko was only 24 years old when he died. He’d played just five seasons with the Maple Leafs, but had helped them win the Stanley Cup four times. Many of his former teammates would later say that Barilko had the makings of a perennial all-star or even a future Hall of Famer. He was certainly one of the hardest hitters in the NHL in his day, but despite scoring one of the most famous goals in hockey history, he was a defensive defenseman. Not a lot of those guys get the glory. Globe and Mail, Toronto, April 23, 1951. Page 21. Toronto Daily Star, April 24, 1951. Page 18. I don’t actually get into those rumors in my book, but I think that even if you know the history of the Maple Leafs up and down and backwards and forwards, you’ll still find plenty of stories you don’t know. I’m really thrilled with how it’s all come together. It was more like editing a huge documentary film than writing a book. I’ll be posting an even more obvious “commercial” for it in the next few weeks. In the meantime, the publicists at Dundurn tell me it’s becoming increasingly important these days for books to get a good spike of online pre-order sales before they’re released. Pre-orders signal to bookstores that they need to stock up on the title. This can make a huge difference to overall sales. 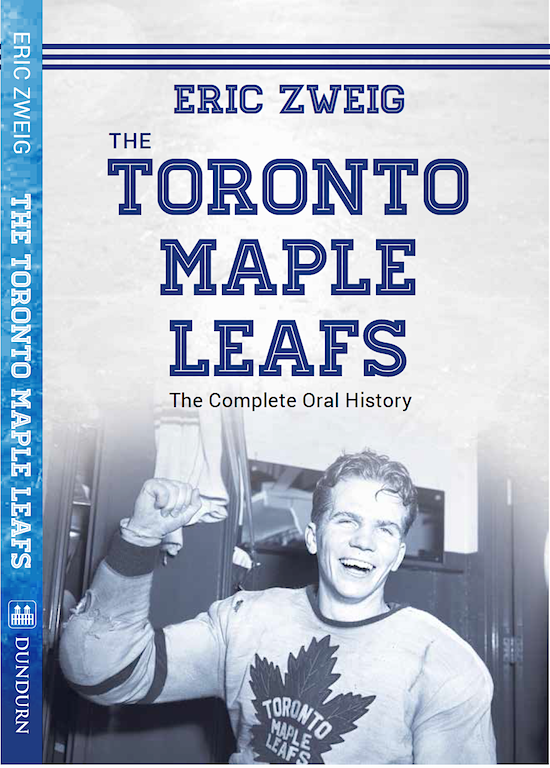 So if you had already been thinking about recommending or buying The Toronto Maple Leafs: The Complete Oral History, please consider pre-ordering a copy at Amazon or Indigo or wherever you like to buy your books. Oh, and don’t be shy about ordering any of my other books through these links either! Great choice with Barilko, Eric. Can’t wait to read it, Bear. When does it come out? When and where will the launch be??? Bookstore web sites seem to have it for mid November, but the official date is October 28. Not sure yet about a launch party. 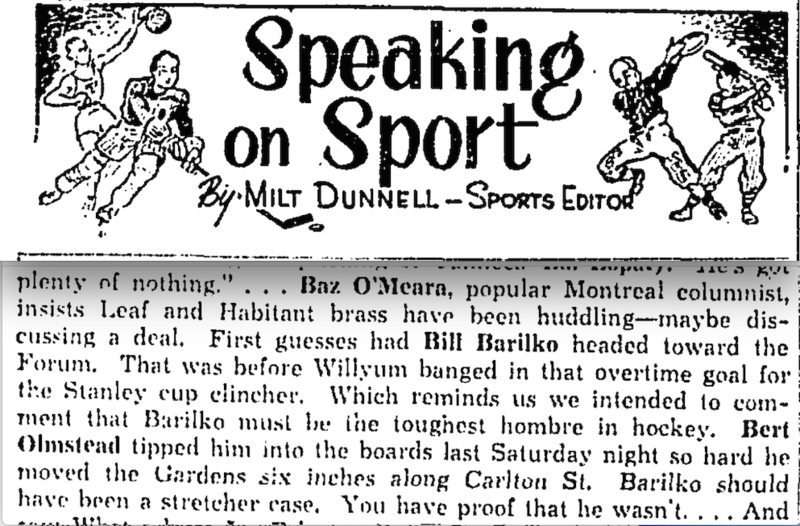 During the 1950-51 season, Bill Barilko got caught up in a number of distractions. He was dating several girls, at the racetrack with Max Bentley a great deal, and had his name on an appliance store on the Danforth and was looking to open another in The Beach. The off-ice activity was compromising his play, and he was going to be sent to Pittsburgh of the AHL. He was also quietly being shopped. Smythe thought it would be best for Bill to get him out of Toronto, even though Smythe loved him. Led by Harry Watson and a few other teammates, they sat Bill down and had a pseudo intervention. He straightened up and had a great end to the season, culminating, of course, in The Goal. If for some reason it can’t be used, consider Turk Broda driving one of Smythe’s dump trucks. 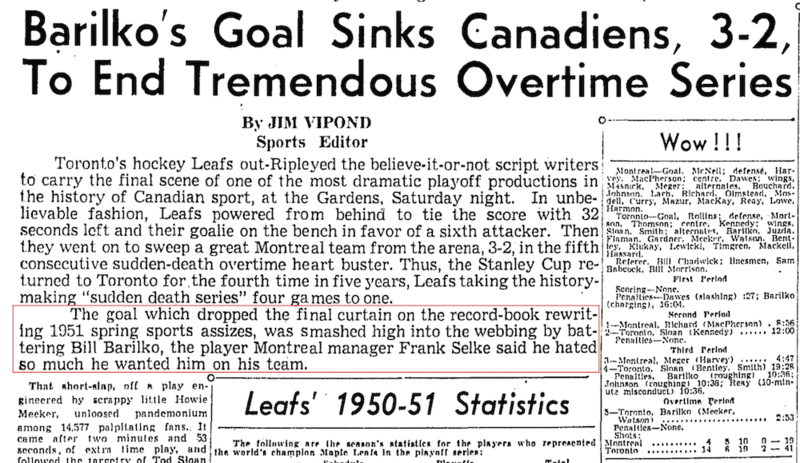 I was about 6 months old when Barilko scored that goal to end the 1951 playoffs. He is certainly worthy of the cover. Funny that the first two things that come to my mind when I think about the Leafs are Frank Mahovlich and the Maple Leafs tin players on my table hockey game. Loved the uniforms. I still have the tin players for all six teams and the flags that hung over the game. Anyway, I ordered the book yesterday. Looking forward to reading it. I never knew of Bill Barilko….how very tragic his life & career ended at such a young age! Thank you for some more NHL history!